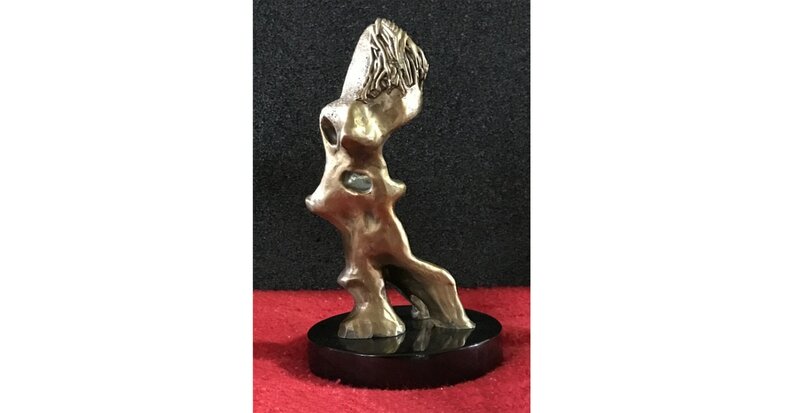 In this issue of the Gordon Art Place Newsletter I am presenting my recent bronze and cast marble sculptures. Although much of my work over the last many years has been primarily Oils on Canvas, I also have a history of doing sculptures in both stone and bronze. 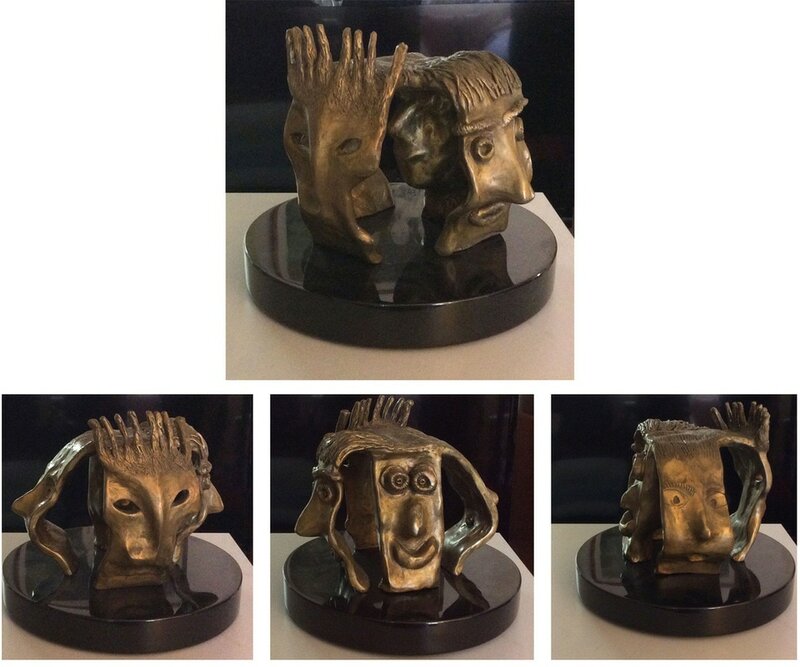 My sculptures are a consistent reflection of my “figurative abstract surrealist” style. Also in this issue is my short thought about how I feel art is a reassuring and intellectually satisfying recourse in a turbulent and changing world. In addition, I invite you all to my next semi-annual Weekend Open Studio. 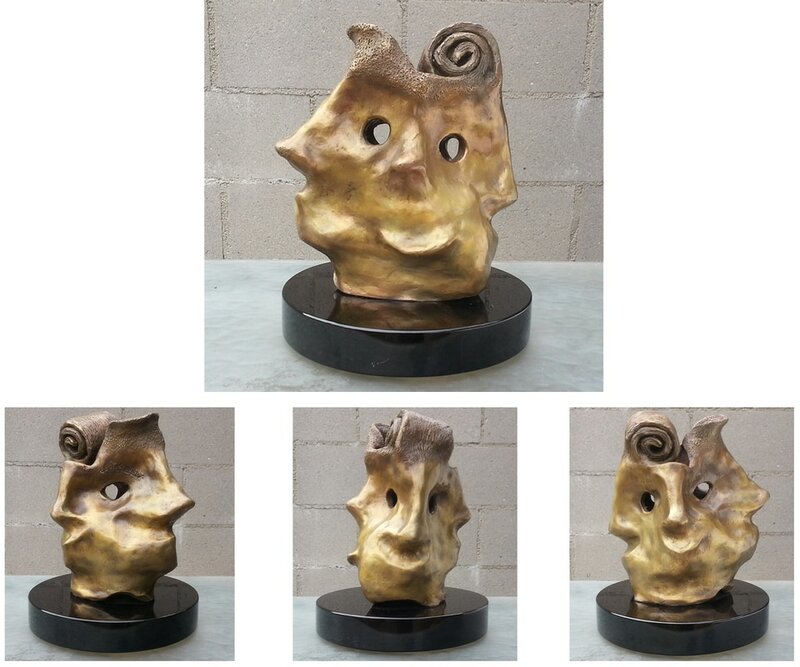 The "Four Faces" series consists of four bronze sculptures that were completed during 2016 (I describe the process for creating bronze sculptures in a previous newsletter). Each in the series is an edition of 5. Each piece has at least four facial views and is mounted on a turnable black marble stone to facilitate your viewpoint. 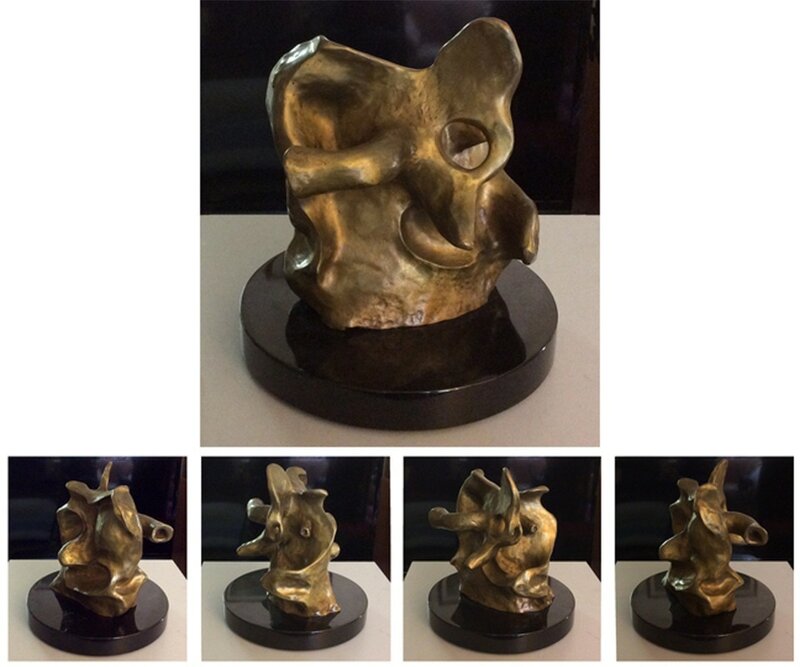 Sculpture is meant to be seen from all angles like viewing the multiple facets of a diamond. 10.5" X 8" X 6.5"
​"A Modern Relic" and "Erudite Man" are two of my newest bronzes (in editions of five) completed in 2017. 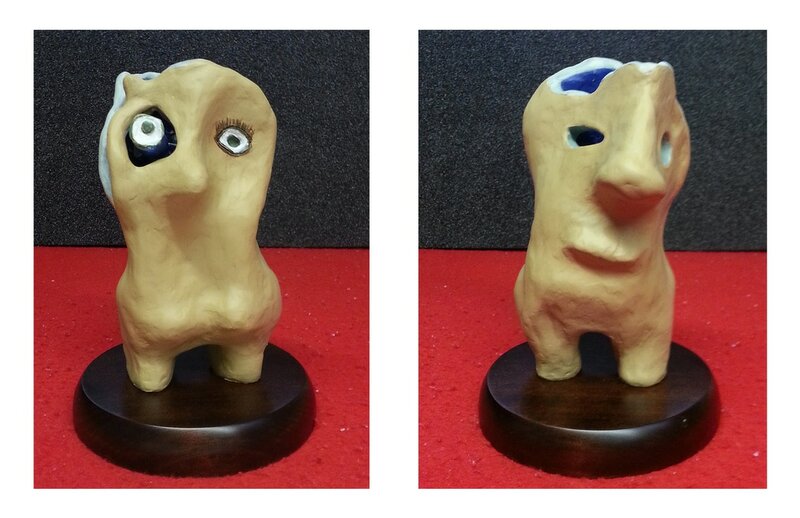 These are two abstract surrealistic figures. My work is sometimes purposefully whimsical, humorous or satiric. I engage in the fantastic, and play with reality. A "Modern Relic" is a joke and an oxymoronic title. 10" X 4.5" X 5"
14" X 5.5" X 4"
​The next four sculptures are "cast marble" which is a combination of silicone and marble powder. Similar, but very different from casting in bronze, the basic model that these sculptures are developed from is clay. Then a mold is made from the clay model. The mold is made of silicone (similar to the silicone mold for bronzing), however in this process there is no molten metal and no wax stage. The Resin, a mix of silicone and powdered marble, is made directly from the mold. Because this process is much less complicated than bronze casting, many fewer steps and less dangerous, it is also much less costly. 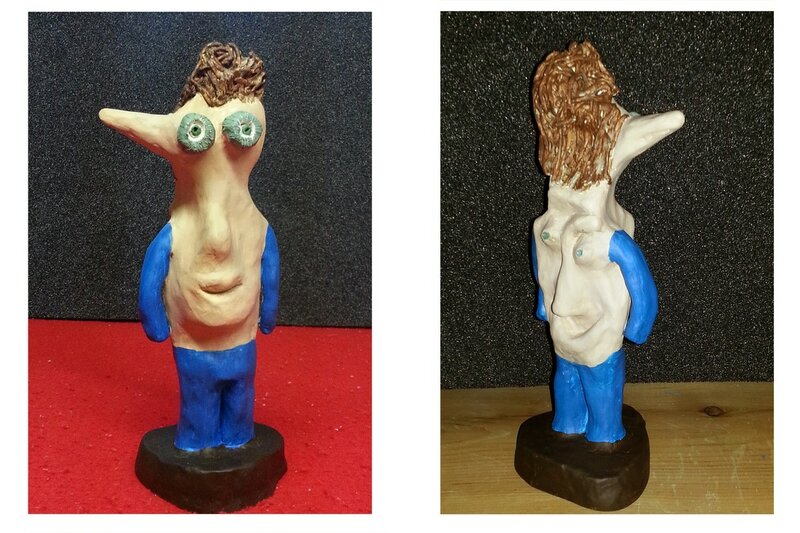 Therefore I can provide these sculptures to a wider audience at much less cost. The cast marble series are in editions of twenty. Each is hand cast and hand painted. 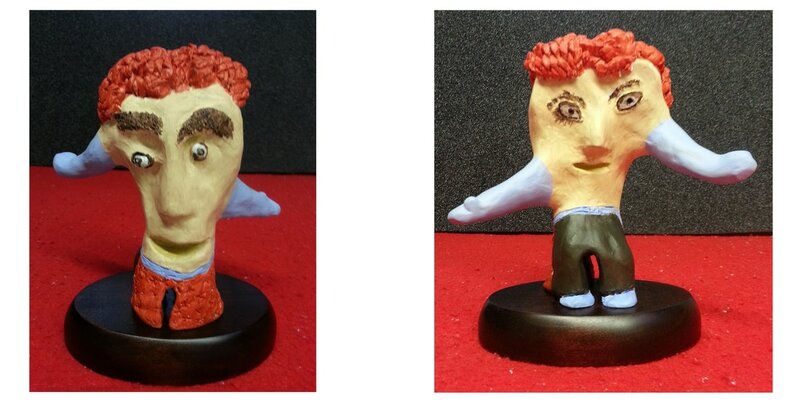 The first in the series is "The Little Guy" He can be seen from two sides. "Nearly Naked" is another surrealistic fantasy, a little risqué and a little joke. 12" X 6.5" X 4"
"Surreal Nakedness" is a bit of a tease. Here you see two sides of the same piece. Let your imagination wander. The "Organic Couple": This couple has been together a long time and have grown organically together over the years. They exhibit slight floral characteristics as they bloom in their maturity. 14.5" X 7" X 7"
​My next show will be my semi-annual Open Studio. This event will be the first weekend in May (6th and 7th), Saturday and Sunday afternoon from 2 to 4:30 PM. Please plan to stop by for a look at recent work and to see some of your old favorites. 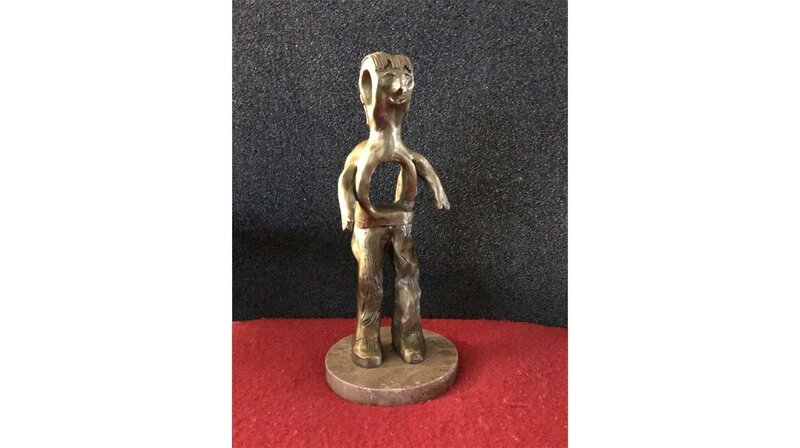 On display and for sale will be bronze and cast marble sculptures, pen and ink drawings, etchings and previously unseen etchings, new oils and acrylic paintings on canvas, and possibly some new metal sculptures. Watch for our next Open Studio in Fall 2017. Shipping and Returns information: For local sales in Greater Metropolitan Los Angeles there is no shipping charge, I will deliver the piece. However, Los Angeles and State of California Sales Tax for Los Angeles sales are currently charged at 8.75%. 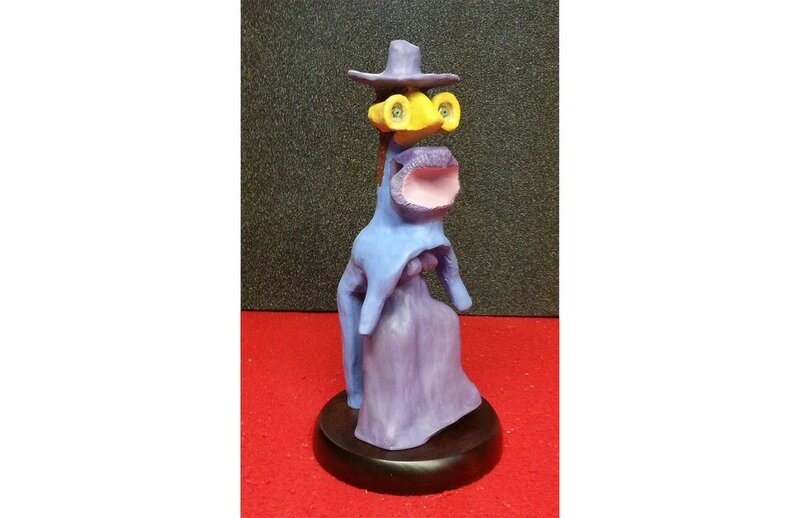 If you are purchasing one or more of the sculptures in this newsletter and it needs to be shipped out of Los Angeles, there is a 5% shipping charge added onto your purchase. If you are not satisfied with your purchase and it is within 25 days of your purchase, you will receive a 100% refund, less the cost of return shipping. Sales Tax adjustments for people charged sales tax but who do not live in California, will be refunded as appropriate. Sales outside of the United States will be shipped but there will be extra shipping charges, possible customs and other taxes added, as appropriate. Barry Gordon is available for commissions, consultations and curatorial sessions by appointment. For more biographical information go to GordonArtPlace.com or call 424-341-4278. Mr Gordon has shown nationally and internationally, owned his own gallery in Santa Monica (1985 - 1996) and had a 30-year retrospective in 1994. See his CV for showing history at GordonArtPlace.com.